There is so much arcade game material on these DVDs that it's really too much to list. There are manuals, schematics, art, sounds, troubleshooting, tv shows, movies, archived websites and more. Shown are a couple screenshots of the root directory of each DVD. Keep in mind that the capacity of a DVD is roughly 4.7GB so there's lots of stuff. These DVDs are completely free. The only costs are shipping, packaging materials, insurance and blank DVD's. I keep a few sets already made up so I usually ship the day after I receive a request. All DVD sets are 4 disc sets. If there is a problem with any of the DVDs just let me know and I will be glad to ship a replacement. If you cannot read any of the disks, it means your DVD drive cannot read burned DVDs, usually because it's an older first generation or cheap drive. Try updating the firmware of the drive. 1. Mail me a self addressed, stamped envelope along with 6 DVDs (in case I burn a bad one. Any unused DVDs will be returned to you). I will burn them and mail them back to you within 7 days). You must reside in Canada for this method or mark the DVDs value as 0.00 or I will not pay to pick them up. Contact me before sending me anything so I know they're coming. 2. Send 12.00 to cover Shipping, Mailing Materials, Blank DVD's and Insurance, using paypal.com to sales@hobbyroms.com. I will purchase blank DVD's locally, make copies of the 4 DVD set, and ship them to you. The DVD's will be individually packaged in paper sleeves with see-through windows, and mailed-out in sturdy cardboard mailers. 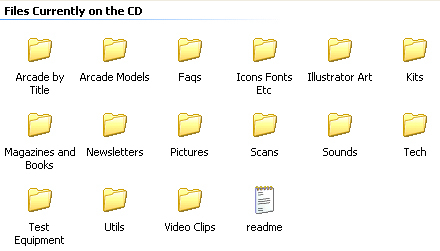 There's no need for a screenshot of this DVD because there is only one folder at the root of the DVD that has many of the arcade related websites on the Internet archived in sub-folders. Note: Please do not email me asking what is in a particular folder on any DVD. Also the DVDs are non refundable for any reason. As noted above, if any are defective I will send replacements.